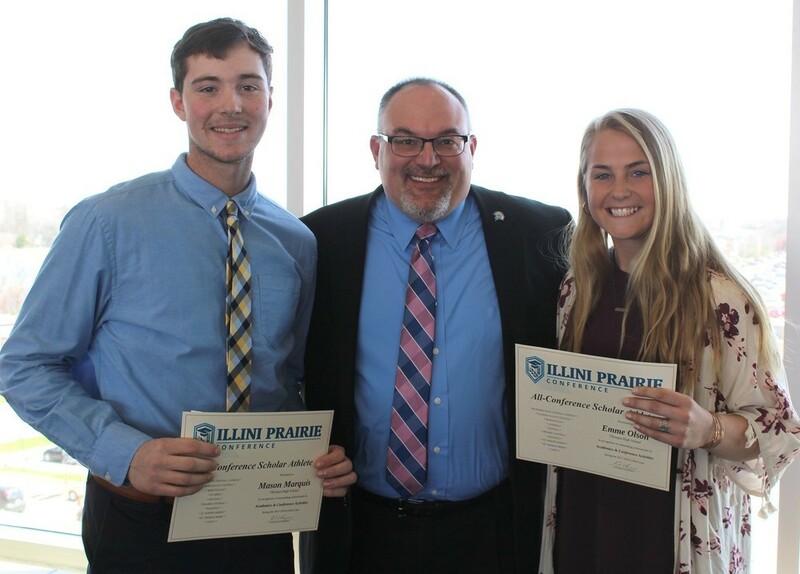 Illini Prairie Conference schools came together Thursday, April 26, to honor their 2018 scholar athletes during the Illini Prairie Student Recognition Banquet at Illinois State University’s Hancock Stadium Clubroom. Administrators from Bloomington Central Catholic High School, Chillicothe Illinois Valley Central High School, Monticello High School, Stanford Olympia High School, Pontiac Township High School, Fairbury Prairie Central, Rantoul Township High School, St. Joseph-Ogden High School, St. Thomas More High School and Tolono Unity High School selected one male and female student athlete based on their academics, character and involvement with athletics and organizations within the conference. This year’s recipients are: Caroline O’Connor and Owen Talbott from Central Catholic; Allison Sniff and Evan Fouts from Illinois Valley Central; Aliyah Welter and Noah Zimmerman from Monticello; Emme Olson and Mason Marquis from Olympia; Emma Jacobs and Jakob Grieff from Pontiac; Faith Bachtold and Billy Printz from Prairie Central; Lindsay Jordahl and Jared Motley from Rantoul; Sarah Acklin and Riley Baker from St. Joseph-Ogden; Brianna Hopper and Jake Sellet; and Taylor Millsap and Ethan Miebach from Unity. Honorees received a certificate and $100 award. The Illini Prairie Student Recognition Banquet was a first for the conference, as the inaugural year of the Illini Prairie Conference comes to a close. Schools from the former Okaw Valley Conference had held similar banquets in the past.